Emerging technologies have afforded workers today a different kind of environment. Whether it’s the opportunity to telecommute, flexible schedules, remote offices or shared work spaces, the way we do business has evolved from the traditional 9-5 of days past. Our own studies of the federal workforce have further reinforced this notion. While we have been pointing this out to federal marketers for the past year and a half, it now has a name. A recent article by Inc, has given a title to this blurred line between our work life and our personal life. Instead of a work-life balance, this is called work-life integration. Work-life integration, for many, eliminates hard boundaries and is ideal for professionals who want to shape their own workday. It allows them to incorporate parts of their personal life throughout the day, including needs brought on by children, elderly parents, or other activities. However, for others, this integration is a negative evolution, forcing them to over-incorporate work into every part of their life, while not giving personal parts of their life the same kind of priority. Whether workers are embracing this, or fighting it, work-life integration also affects how we consume media and communications for work. Enabled by mobile technology, it is not surprising to find professionals checking personal emails or visiting social sites throughout the workday. Conversely the same technology allows them to just as easily check work emails or read online articles during personal time. 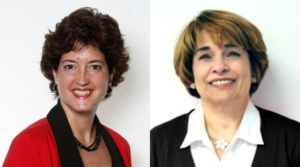 Does work-life integration affect federal workers as well? While workers at some agencies are restricted by security concerns, according to a couple of Market Connections studies, the resounding answer is YES. According to a Mobility PulsePoll™ of federal audiences and their mobile activity, we found that 4 out of 5 felt mobile devices caused an increase of 3 or more work hours by being connected. Nine out of ten admitted to checking work email on their mobile devices on weeknights and weekends and three quarters were checking their work email during vacation! We have also asked federal employees about their teleworking frequency in our annual Federal Media & Marketing Study. Approximately one quarter stated they were teleworking one day a week or more, with civilian agencies leading the pack and those in the DC area participating more often than those outside. We also learned that one-quarter of federal employees in the DC area commuting by bus or rail checked their work emails during their commute, in this “grey” period between personal and work time, they were conducting work-related activities. What does this mean for those of us trying to reach federal audiences? Like the rest of us, federal workers are also experiencing a work-life integration and those looking to market to them should take this into consideration when putting together their marketing strategies. Marketing and media placement do not necessarily have to follow traditional 9-5 work schedules or traditional media channels. However, if reaching them during non-traditional hours is something you’re willing to test, consider the following: 1. Which media/communications channels they are visiting; 2. Not all content during this time is equal. Take into account what type of marketing they are more open to unlocking (Video? Podcasts? ); and 3. Consider your goals for marketing during non-traditional work hours and tailor your efforts to align with your goals. For example, social media may increase brand awareness, while website placement or earned media might be better to increase the depth of understanding of your products and services. Understand the goals of your marketing and what you want them to take away from your efforts. To learn more about the media habits of those in the federal workforce, visit Market Connections Federal Central for the latest studies, blogs, and the Federal Media & Marketing dashboard, a one of a kind database that provides detailed information on the media and marketing habits of thousands of federal workers, inside and outside the beltway, across all agencies, product categories and decision-making levels. Federal marketers understand that when it comes to their budgets, every dollar is a precious resource, and having a strong strategy in place is essential. With that in mind, ten years ago, Market Connections and Sara Leiman launched the annual Federal Media and Marketing Study (FMMS) to help federal marketers hone in and perfect their campaigns using solid third-party research. The first (and still only) of its kind, the survey garners responses from more than 3,000 decision makers inside and outside the beltway, to understand their media consumption habits for print, digital, broadcast and social platforms. After ten years, the federal media study continues to be a must-have marketing tool in the federal arena. Market Connections: Think back to 2008. In the absence of research in the federal market space, what were you and colleagues like yourself doing to try to reach the market? SL: The prevailing thought years ago was to lead with frequency by providing continual visibility in the same media outlets that best matched a given demographic; whether that was print, websites or broadcast. While the media community had very separate sources of research for each type of media; including: audit statements for print, Arbitron for radio, Nielsen for TV, and a growing number of ad serving and ad measuring companies for digital; the media community had nothing that looked at media habits holistically in a single study where one could compare different channels within the federal decision-maker community. This lack of information did not allow us to provide custom recommendations by audience. We had no data that would tell us which media outlets were preferred by different demographics, for example, those who purchased IT services versus finance. Without the ability to prioritize media by specific audience, we could not prioritize their preferred method of delivery either; whether it was print, digital, radio or other outlets. Market Connections: When you first got started, can you tell us what were some of the toughest hurdles you had to overcome in creating a comprehensive study like this? LD: The biggest hurdles in any research project are constructing an effective survey and ensuring sampling is sufficient and valid. This study was no different. We spent a lot of time crafting the survey questions and testing them before we ever rolled out the first survey. From a sampling perspective this study is more challenging than most because it requires such a large sample size for the data to be valid. Sampling continues to be a challenge in the public sector as more and more agencies have adopted a “no-survey” policy. Our federal insights panel that we have built over the years helps us fill in the gaps. Market Connections: What are some of the biggest lessons learned over the years? SL: Overall, we learned that the federal audience is NOT a one-size-fits all. By this, we learned how media habits differed. For example, we learned LOCATION made a big difference. Media habits are very different inside versus outside the beltway as well as among civilian- versus defense-type agencies. DEMOGRAPHICS also had an impact on media habits including job function and area of purchase. However, most importantly, and especially today versus 10 years ago, we learned it’s not just about the media; it’s also about TECHNOLOGY. It is important to understand how technology is used for targeting (by market, by domain, by specific demographics), for delivery (geo-fencing versus desktop or mobile by general location) and understanding how to overcome firewalls that are evermore present within government. Federal executives have more choices for information access than ever before and they are using them all. Just like the rest of us. This survey captures the pulse of this audience with regards to their media habits. Market Connections: What is the most interesting change for you in the market over the past 10 years, from your perspective? 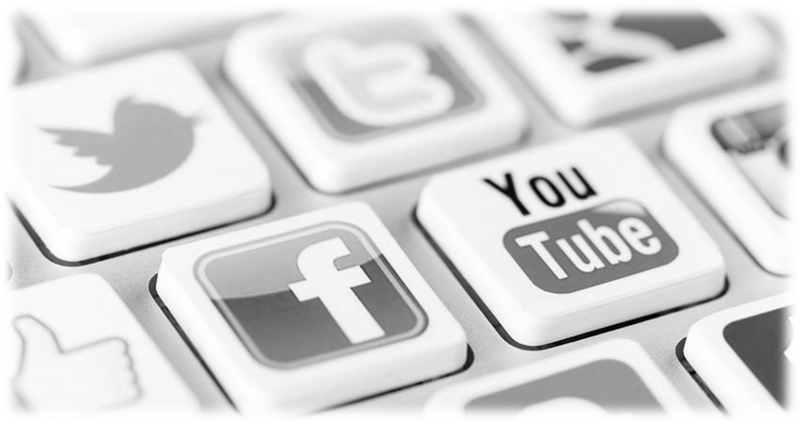 LD: The most interesting has been the evolution of social media in the federal market. We didn’t even call it social media 10 years ago, we called it “networking sites” on the survey and listed examples LinkedIn and MySpace. The total that used those tools was less than 5%. The use of social media has exploded over the last ten years and forever changed media consumption behavior –attention spans are shorter and federal decision makers consume information from many more sources than ever before. That presents both opportunities and challenges for federal marketers. Market Connections: As you’ve done this study over the years, what are some of the biggest changes you’ve seen in terms of study questions, analysis, and presentation? LD: The primary goal of the study really hasn’t changed. It has always been to understand the media consumption habits of federal government employees. And we’ve always kept a core set of questions in order to track changes and trends over time. But there have been some things about the survey itself however that have changed over those years. Throughout the years we’ve seen changes in media and in the federal marketplace and we updated the survey to capture those changes. Whether it was the addition of new media outlets, product categories and job functions, or technologies (the growth of mobile) and platforms (the advent of social media), the survey evolved as the media landscape changed. We also keep the study fresh each year by including a few questions that are topical to the federal market environment. And last, but certainly not least, we listen to our clients, adding questions that are of particular interest to them and fit within the objectives of the federal media study. Market Connections: How have your clients benefited from the data over the years? Can you share a story of a client who has used study results and has seen success? LD: We had a client who was running radio spots in the DC area to influence perceptions of their company on key issues, particularly members of Capitol Hill. They contracted us to do a series of surveys to measure perceptions before, during and after a radio campaign. The mid-campaign survey, showed no movement in market perceptions. Given the size of their investment in radio we were surprised by this. Upon review of their media plan, we realized their advertising agency (not located in DC) was recommending stations that did not well target federal decision makers. We suggested they use the FMMS data to recast their radio buys for the second half of the campaign. The final leg of the study showed significant improvement in perceptions. Using the data to target federal decision makers in the right media outlets made all the difference. In addition, over the years we’ve seen companies that use our data in very different ways beyond media planning and buying. We’ve seen clients use the information in sales playbooks to help sales and BD teams have a better understanding of their accounts and account behavior. While others have used the data as an input when creating buyer personas (a detailed representation of your ideal customer that helps determine where to best focus time and investments). 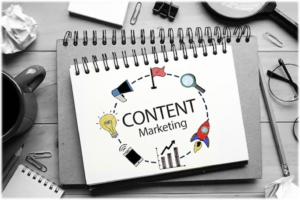 Clients also use the data to help target content placement and PR pitches. Market Connections: Why would you recommend federal marketers purchase a subscription to the dashboard? SL: As industry professionals, our job is to make sure that we are investing our client dollars in the most efficient way possible. The customized reports by demographic that are available in this survey database allow you to view and understand the most comprehensive and efficient media for any demographic within government. LD: No one has an unlimited marketing budget. 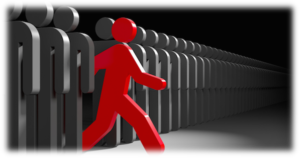 Federal marketers are under increasing pressure to demonstrate success. There is not a lot of wiggle room to make a mistake. It is easy to waste a lot of money very quickly in this market. The FMMS data helps ensure that companies are getting the best ROI they can on their marketing investment by effectively reaching their target audience. Learn more about the study and subscribe to the dashboard. In the past, we have shared some interesting insights from our Federal Media & Marketing Study. We highlighted how federal employees respond to targeted advertising across websites and social media sites visited for personal reasons. 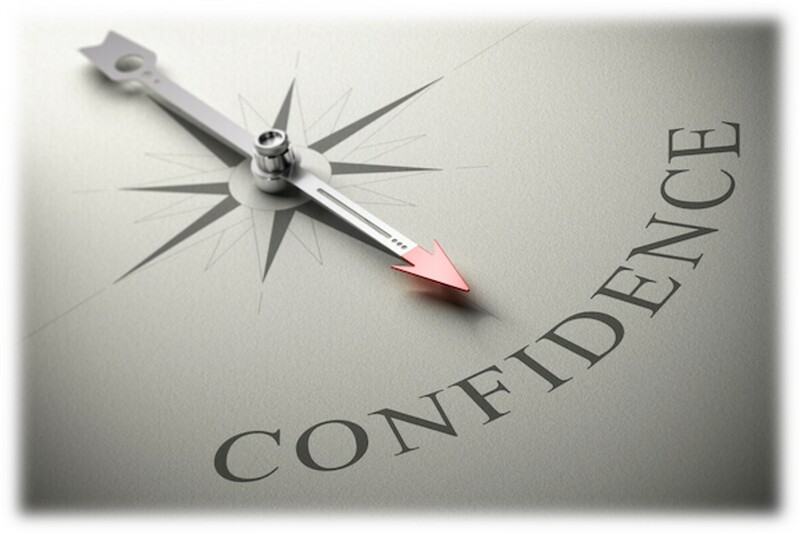 We also discussed the confidence levels they have in the news reported from different sources. But year after year, what our audience wants to know is which digital sites are feds actually visiting? 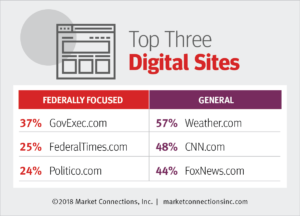 Leading the list of top federal and congressional sites is GovExec.com, with over one third (37 percent) of federal decision makers and influencers listing it as a site they visit. Rounding the top three, are FederalTimes.com (25 percent) and Politico.com (24 percent). In addition to being first among federal and congressional sites, when compared to the top general websites including Weather.com, CNN.com and FoxNews.com, GovExec.com ranks fifth among these high-volume sites, proving this website is one marketers should definitely consider if they are trying to reach federal audiences. 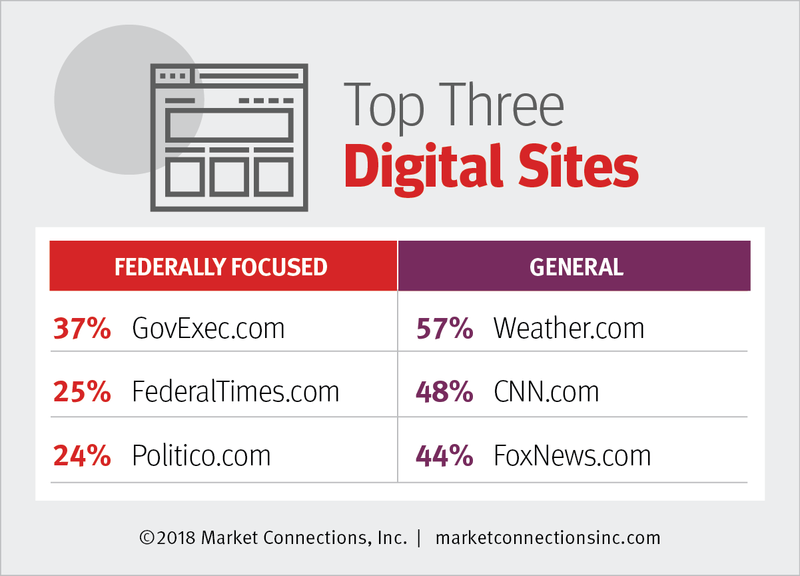 While GovExec.com, ranks at the top of both federal and general digital sites across the overall audience, if you were to slice and dice the data by demographic, the list of top digital sites looks different. When focusing on defense agencies, DefenseNews.com and MilitaryTimes.com rise to the top of the list of federal and congressional digital sites visited. 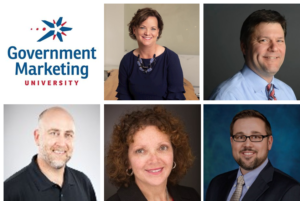 While a general direction for the overall federal audience is helpful, we know federal marketers often need more detail for specific agencies, product categories or level of decision-maker. Whether you need data to launch a broad awareness campaign or a deeper dive for more detailed information to support your agency-based marketing, subscriber-level access to the Federal Media & Marketing Study data dashboard can help federal marketers track media habits based on specific demographics, including agency type, specific agency, location, job function and purchasing area, among others. As federal marketers, we sometimes forget that our audience are not just federal decision makers and influencers, but regular people who watch the same TV shows, visit the same social media sites, visit the same websites and have the same media habits as the rest of us. Feds are people too! With that in mind, the 10th annual release of the Federal Media & Marketing Study wanted to ask about their habits when it came to how they responded to advertising… and more importantly work-related advertising. To our surprise, and the relief of many, at least six out of ten respondents had seen work-related advertisements in both websites they visit for work reasons and personal reasons, and four out of ten specifically saw work-related advertising in their personal social media – a sign that advertising targeting (or re-targeting) is viable in this market. This was further reinforced during a discussion with our excellent agency panelists at the recent study release breakfast. The blurring of the lines between work and personal lives provides a great opportunity to reach decision makers with work-related content in their personal sphere. The big question is, “Are they clicking on this advertising?” Yes, yes and yes! 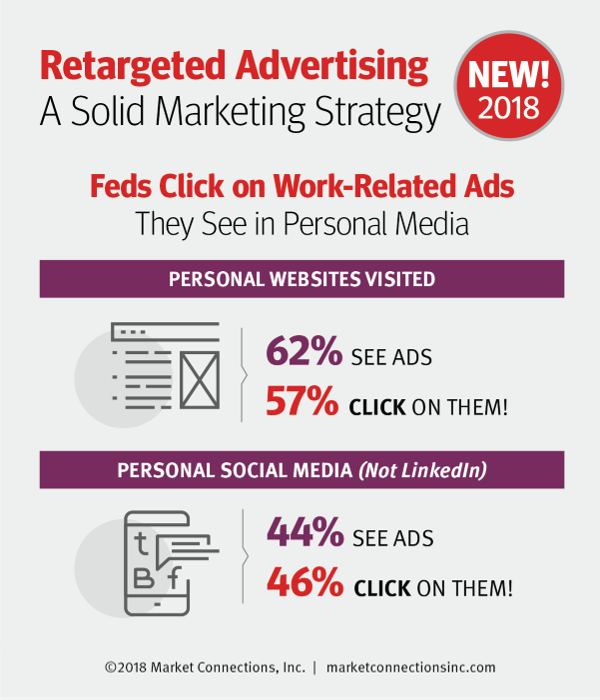 Nearly six in ten have clicked on work-related ads on websites they visit for work and for personal reasons, and nearly half click through on personal social media (even when it’s not LinkedIn!). What does this mean for our government contractor clients and those trying to reach federal audiences? In addition to federal media placement, you may want to invest in targeting and re-targeting on social media and websites feds are visiting for personal reasons. How do you know what websites you should focus on? Where should you invest your digital advertising dollars? What websites are feds visiting most? With three years’ worth of data on the media habits of the federal audience, the Market Connections Federal Media & Marketing Study dashboard can help marketers develop a sound advertising and marketing strategy based on solid research. Among many features of the newly updated and easy-to-use dashboard, marketers can analyze which digital websites their audience is visiting by agency, agency type, location, job function or even purchase area to help them make decisions on media buys for advertising and sponsored content. Learn more and subscribe to the dashboard. The federal workforce may be as polarized in their views of the media as the general population. Last year, the Federal Media & Marketing Study asked federal workers how they felt about “fake news.” Two-thirds said recent commentary about “fake news” had at least some impact on their perceptions of news organizations’ credibility. This year Market Connections wanted to dig a little deeper. Thinking there might be some halo effect that the media source has on the advertisers, we wanted to understand how confident decision makers felt on the news reported from different media sources. What we found is that decision makers felt more confident about news reported from federal publications, such as Defense News and Government Executive, compared to many general media outlets, including CNN and Fox News, which hovered near the bottom of the list. Many media outlets, including print, digital and radio, fell somewhere in between. And to no surprise, stark significant differences in confidence were evident by agency type and political party affiliation. What does this mean for government contractors and their agencies when it comes to advertising and other media spending? Join us on November 8 to learn how confident decision makers are of the news reported by different media sources, how much time they are spending with different types of media and the top print and digital publications both inside and outside the beltway, among other key data helpful to federal marketers, agencies and media outlets.